A couple weeks ago I showed you how I tamed my tangled and unusable yarn stash. As I was sorting through my fibers I realized that I had quite a bit of leftover worsted weight acrylic. I will happily admit that I am not a yarn snob. I enjoy working with fancy fibers and indie dyed, but I have no problem using inexpensive acrylic in projects, too. Since I have been sock obsessed for the last few months, I decided to whip up a quick pair of worsted weight acrylic socks. I think you are going to love this pattern. There's no grafting, no picked up stitches and an adult sized pair of ankle socks can easily be completed in a weekend. This pattern uses shadow wrapped short row heels. If you are unfamiliar, here's a free shadow wrapped short row heel tutorial that also includes an explanation of how to make the necessary twin and triplet stitches. All Rnds: [K1, p1] around. Rnd 1: [K1, p1] across. Rnd 3: [P1, k1] across. Rnd 4: K all sts. Rounds begin and end at the left-hand side of the sock. CO 32 (40). Work 1 x 1 Ribbing for at least 1 (1 ½) inches. If you prefer a longer leg length, simply work more rnds of 1 x 1 Ribbing. Rnd 1-4: Work Moss Stitch across 16 (20) sts, k 16 (20) sts. The heel section is worked using the Shadow Wrapped Short Row Method, across half of the sock sts, 16 (20) sts. Row 1 (RS): [K1, p1] 7 (9) times, k1, tw st in last st, turn. Row 2 (WS): P 14 (18), tw st in last st, turn. Row 3: [K1, p1] to 2 sts before tw st, k1, tw st in next st, turn. Repeat Row 3-4 until there are 5 (7) twin stitches of each side of the heel and 6 regular stitches at the center of the heel. Row 5 (RS): [K1, p1] to first tw st, k both strands of the tw st together, tr st in next tw st, turn. Row 7: [K1, p1] to tr st, k all strands of tr st together, tr st in next tw st, turn. The remainder of the sock is worked in rounds with the right side facing. Rnd 5: [K1, p1] to tr st, k all strands of tr st together, k 16 (20). Rnd 6: K all strands of next tr st together, k 31 (39). All Rnds: Work Moss Stitch across 16 (20) sts, k 16 (20) sts, until sock measures 7 (8 3/8) from the back of the heel or 1 (1 5/8) inches less than desired sock length. For Men's Size: [Skpo, k3] 8 times (32 sts remain). K all sts for 3 rnds. For Both Sizes: The remainder of the toe is worked the same for both sizes. [Skpo, k2] 8 times (24 sts remain). K all sts for 2 rnds. [Skpo, k1] 8 times (16 sts remain). K all sts for 1 rnd. [Skpo] 8 times (8 sts remain). Break yarn leaving a 12 inch tail. Thread yarn onto a yarn needle and pull through the remaining 8 sts to close the toe. Enjoy stash busting all of your acrylic leftovers into comfy house socks. 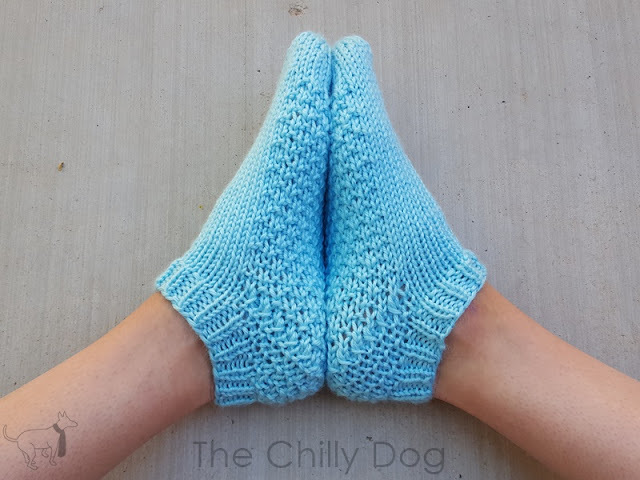 A printable version of my Best Worsted Socks pattern (with additional sizing options) is available in my shop. I'd love to see your finished projects. Feel free to tag me, @thechillydog, on Facebook, Instagram or Twitter with your project pictures. 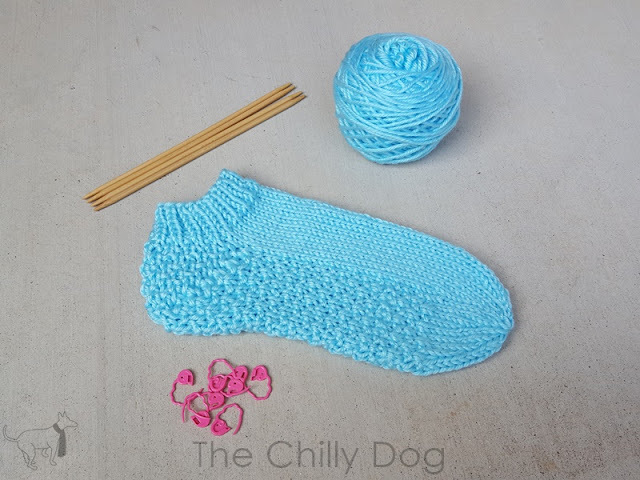 Knit a quick pair of the best worsted socks with your leftover acrylic yarn. No Kitchener Stitch grafting and no picked up stitches. Easy peasy!